and take away their skins and hearts and cut them into quarters and lay them into your tarts in layrs and strew suggar betwen every layr and if you have a mind to have your tarts very fyne you may put in cannall and mace and cloves and cordicidron and orange peal and a litle ambergrise and let your liquor be either white wine or sack. 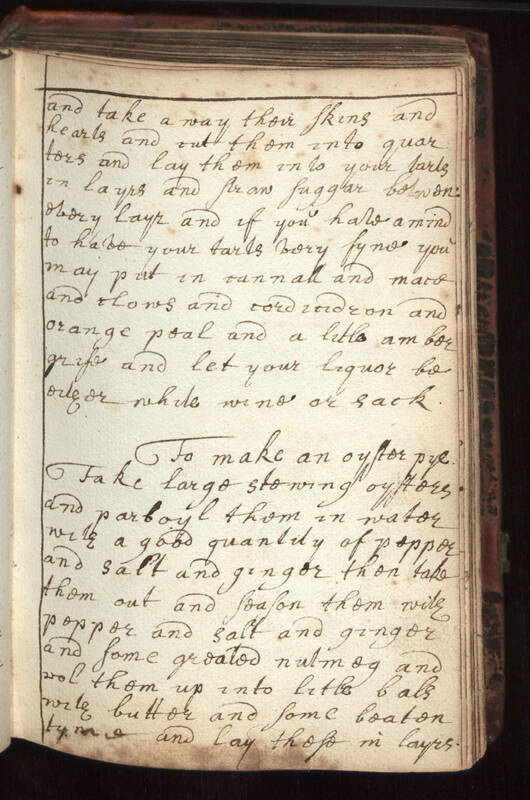 To make an oyster pye. Take large stewing oysters and parboyl them in water with a good quantity of pepper and salt and ginger then take them out and season them with pepper and salt and ginger and some greated nutmeg and rol them up into litle bals with butter and some beaten tyme and lay these in layrs.